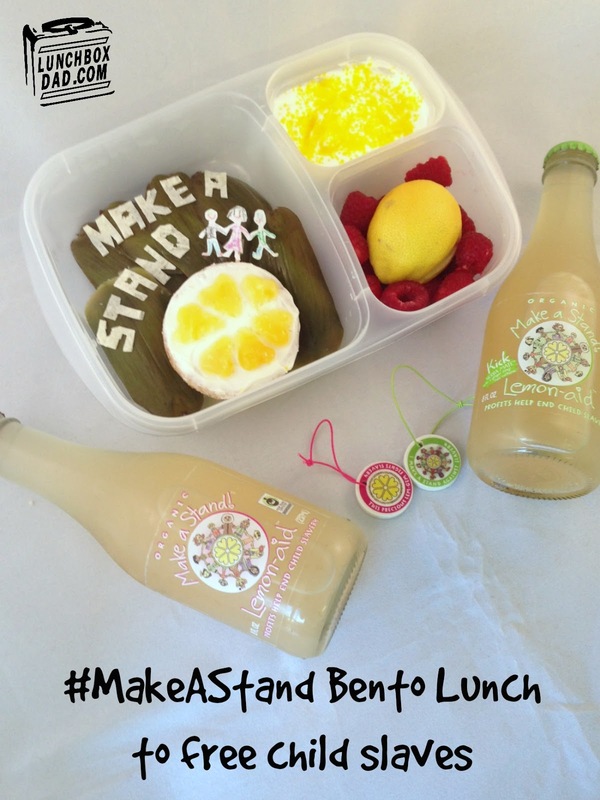 Year 2, Week 29: Make-A-Stand Lemon-aid bento. This week we learned more about a 9 year old girl named Vivienne who has made it her mission to fight child slavery around the world. 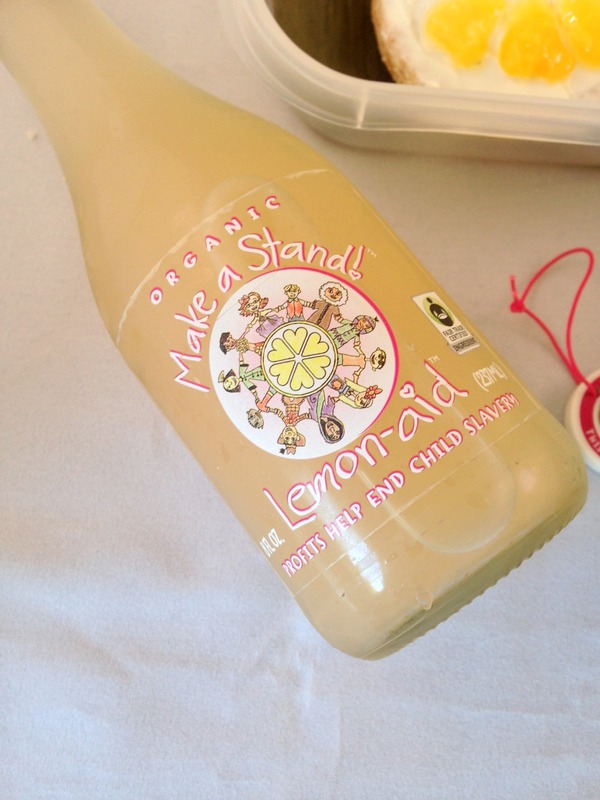 She started selling lemonade to raise money for this and ended up making her own brand of "lemon-aid" which is now available in stores. It is called "Make A Stand." Go to her website to hear her full story and see how you can help and get lemon-aid as well! We each took different parts of this lunch. It was a team effort this week! 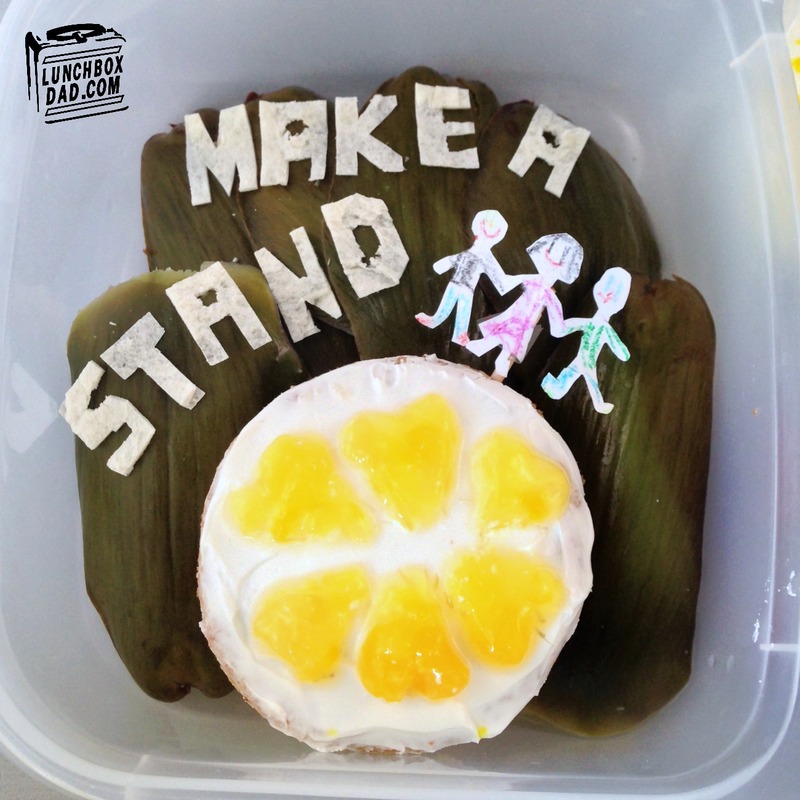 The Make A Stand logo is actually a peanut butter sandwich. The lemon you see on the right is a real lemon. However, you can see in the picture below that we hollowed it out and put a strawberry in there instead. I got the idea from my friend over at Veggie-Bento HERE. We used some of the lemon pulp in the bottom of the Greek yogurt to give it a kick! My daughter also drew the children holding hands. We cut them out and attached them to the toothpick. Then we inserted the toothpick into the sandwich. This was made in an Easy Lunch Boxes container. 1. 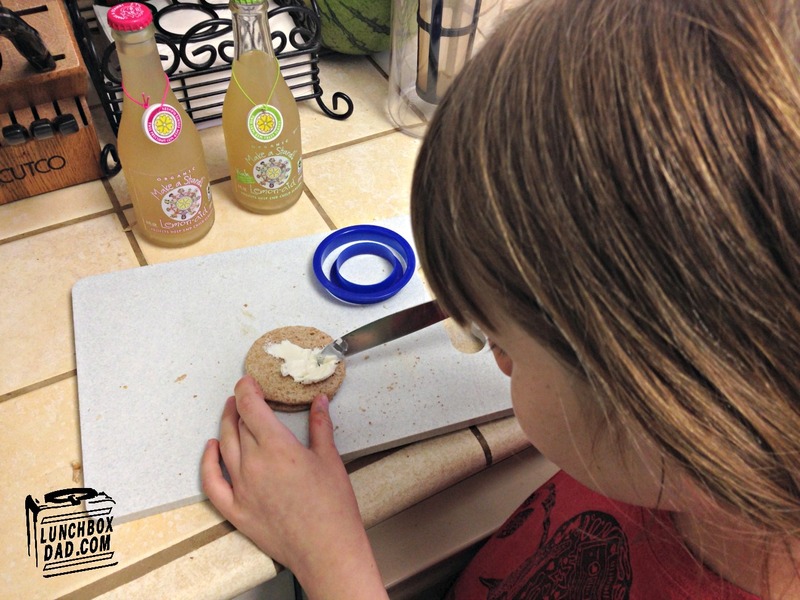 Use circle cookie cutters to make bread circles. Spread peanut butter inside and make a sandwich. Put cream cheese on the top. Use a jam or yellow fruit filling to make heart shapes on the top. I used a pineapple/mango filling. 2. Cut letters out of tortilla. Arrange artichoke leaves in background of main container. I just had these leftover, you can use whatever vegetable you want. Place sandwich on top. Put letters on top as well. Put homemade paper kids on sandwich if desired. 3. 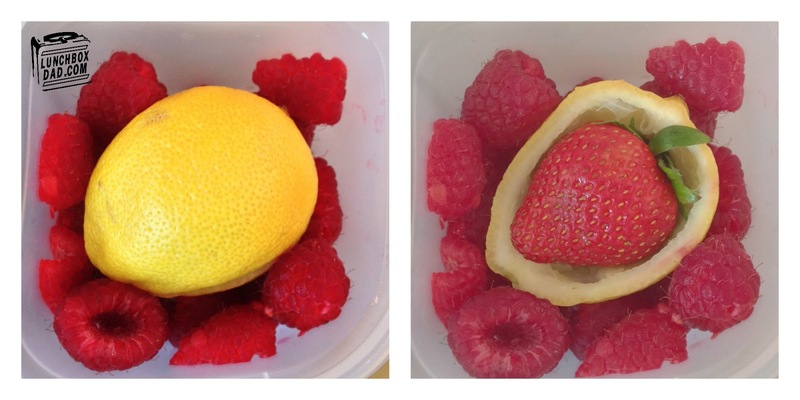 Arrange raspberries and half of the hollowed out lemon in side dish. Place strawberry inside lemon and then put other half of lemon on top. 4. In second side dish put desired amount of lemon pulp. Spoon Greek yogurt over the top. Finish with yellow sprinkles to give a little sweetness to the yogurt. 5. 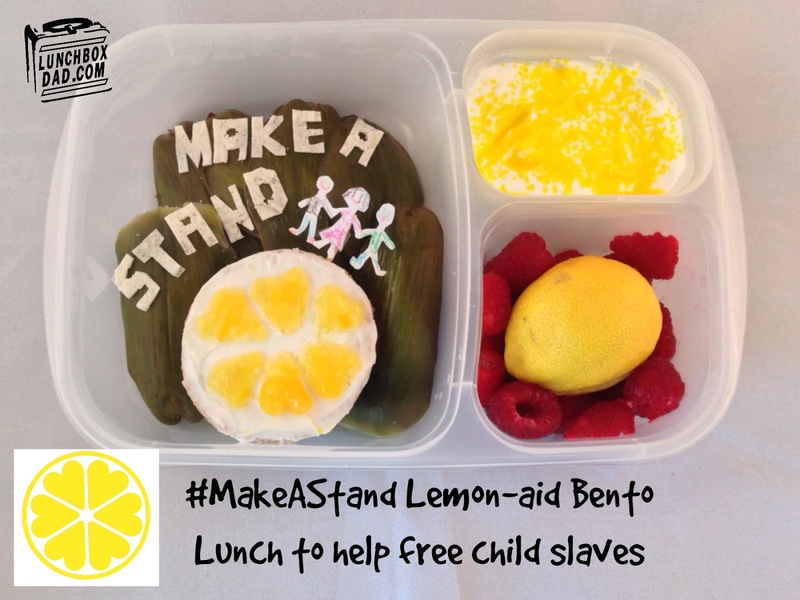 Finally, you have to serve Make A Stand lemon-aid if the lunch is going to go along with the theme! We usually just give water for lunch, but today we made an exception. At this point, I normally ask you to follow me on social media, but instead I want to encourage you to check out www.makeastand.com. Consider raising awareness and supporting the cause to fight child slavery around the world. It is everywhere, so see what you can do to be part of the solution!